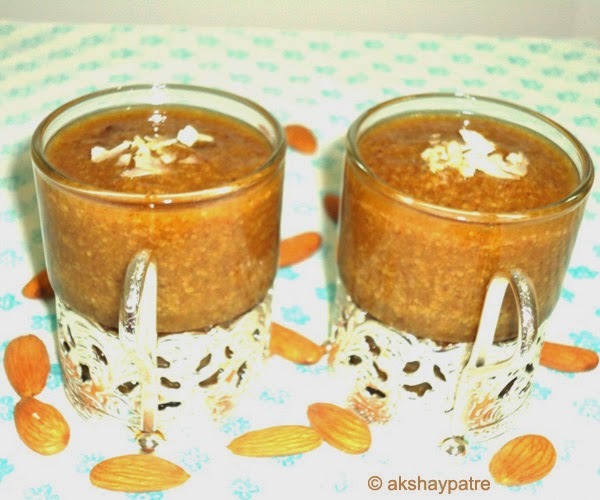 Khajoor payasa or dates kheer recipe - Khajoor payasa is a traditional dessert prepared with dates and coconut milk which tastes extraordinarily great. 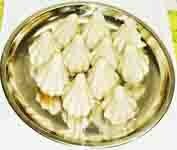 This is a Karnataka style kheer wherein this kheer is prepared in marriage functions and other occasions. You can also make dates kheer by using low fat milk instead of coconut milk. But I prefer coconut milk dates payasa. Khajoor itself is very sweet hence this payasa is made with very little jaggery. Dates are very nutritive, especially for growing children. Having dates in any form is good for their health. Friends, try this delectable kharjura payasa and enjoy. Wash and pat dry the dates. Remove the seeds, slit 40 dates and set aside. Cut the remaining 10 dates into small pieces and set aside. Put the grated coconut in a mixer jar along with 1½ cups water and grind it to a smooth paste. Pour this paste in a thin cloth and squeeze out thick coconut milk and set aside. Put the squeezed coconut in the same mixer jar, add a cup of water and grind. Pour the paste in the same thin cloth and squeeze out thin coconut milk and set aside. Put the thin coconut milk and dates in the same mixer jar and grind it to a smooth paste. Transfer the dates paste to a bowl and set aside. Then pour the thick coconut milk in a pan , add the date paste and mix well. Combine together the dates paste, thick coconut milk and jaggery and stir to combine. Place the pan over a medium heat and bring it to boil. When the payasa is boiling, add the chopped dates. Again bring the kharjura payasa to boil on low heat and simmer for 5 minutes. When done, remove the pan from the heat, add the cardamom powder and keep it aside for 10 minutes. After 10 minutes, pour the khajoor payasa in serving glasses, garnish with cashew nut slices and serve. You can serve it either hot or cold. 1. Wash and pat dry the dates. Remove the seeds, slit 40 dates and set aside. 2. Cut the remaining 10 dates into small pieces and set aside. 3. Put the grated coconut in a mixer jar along with 1½ cups water and grind it to a smooth paste. Pour this paste in a thin cloth and squeeze out thick coconut milk and set aside. 4. Put the squeezed coconut in the same mixer jar, add a cup of water and grind. Pour the paste in the same thin cloth and squeeze out thin coconut milk and set aside. Put the thin coconut milk and dates in the same mixer jar and grind it to a smooth paste. 5. Transfer the dates paste to a bowl and set aside. 6. Then pour the thick coconut milk in a pan , add the date paste and mix well. 7. Combine together the dates paste, thick coconut milk and jaggery and stir to combine. 8. Place the pan over a medium heat and bring it to boil. When the payasa is boiling, add the chopped dates. 9. Again bring the kharjura payasa to boil on low heat and simmer for 5 minutes. When done, remove the pan from the heat, add the cardamom powder and keep it aside for 10 minutes. 10. After 10 minutes, pour the khajoor payasa in serving glasses, garnish with cashew nut slices and serve. You can serve it either hot or cold. Sounds so delicious! will try it for sure. I have never tried making payasam with dates,new n healthy one! !